Located at the tip of the district of Imola, the City of Castel Guelfo occupies a strip of territory along the left bank of the river Sillaro. The community's history dates back to early medieval period. The disputes between Bologna and Imola for the possession of this border area saw the supremacy of the Government of Bologna at the beginning of the 13th century. The progressive enlargement of crops lead by the middle classes of the city during the 13th and 14th centuries, culminated in the settlement of Malvezzi family, named Counts of Castel Guelfo in 1458. The form of "feudal" system put an end to the continual interference of Imola, giving stability to the community. From the middle of 1400 to the end of 1700 the development and the structure of the city were set out and characterized by strengthened buildings and a triangular architectural setting of the village. During 1800, the community of Castel Guelfo faced the troubled period from the French occupation and the unitary state. In 1806, when Piriteo IV Malvezzi died, the properties of Castel Guelfo passed to Hercolani family with the marriage of Maria Laura Malvezzi and Prince Cesare Hercolani. The different and changing political-administrative unifications of the country during the centuries, did not change substantially the urban identity of Castel Guelfo. Historical origins: There is little news found up to the 12th century, but certainly we know that the territory followed the events related to power struggles between Imola and Bologna, who took possession in 1218. The origins of the community of Castel Guelfo are closely related to via Medesano, the road that joins the town to via San Vitale. In 1296 the citizens of Bologna who had possessions here, alarmed by the conflicts on the territories between Imola and Bologna, asked the city government to erect a "fortilicium seu castrum". 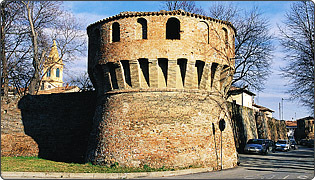 The plea was accepted, but the Council of the municipality of Bologna gave full powers to Romeo Pepoli for the construction of Castrum Guelfum only in 1309. However, the security situation in this border area were increasingly deteriorating, and, in a few years the city of Bologna was repairing the castle of Castel Guelfo with a mold. In 1458 the Shire of Castel Guelfo was granted by the Pope to the powerful Malvezzi family of Bologna, which maintained its dominance until 1796, with the arrival of Napoleon's troops. The main works were realized thanks to the Malvezzi: the construction of boundary wall and the erection of four circular towers at the corners of the perimeter, which still characterize the castle. Services: Information on where to stay and where to eat; maps and brochures of the area information on local events, theatres, concerts. Information on tourist offers of STAI - Società Turismo Area Imolese. Information on the Municipalities joining to S.T.A.I.- Società Turismo Area Imolese (Imola, Borgo Tossignano, Casalfiumanese, Castel del Rio, Castel Guelfo, Dozza, Fontanelice, Medicina, Mordano).